A reference to that which can be declared null and void or no longer allowed to take place: The Smith’s plans to go to Spain on vacation was considered to be revocable depending on whether their daughter Jane recovered soon enough from her illness. Relating to how something can be canceled, recanted, renounced, or annulled: Doug’s old driver’s license was revocably declared invalid when he received his new one. The act by someone having the authority of annulling, or canceling, something that was done before: Sharon was told that not paying the fine for speeding could mean a revocation of her driver's license. Relating to something which can be canceled or withdrawn; especially, an offer to make a contract or some kind of a legal agreement: When Robert got his debit card from the bank, a revocatory statement was included, which said that the use of it could be denied if he withdrew more money than he had in his account. 1. 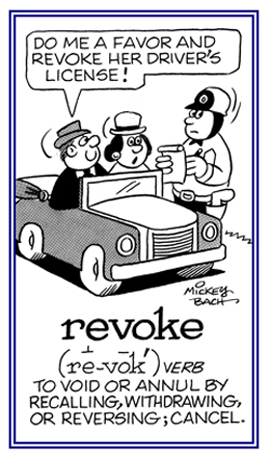 To annul, or to make void, by recalling or taking back; to cancel, rescind, repeal, or reverse: Jill's driver's license was revoked by officials because she was considered to be a reckless driver; especially, since she had had so many traffic violations. James was allowed to use Marie's cell phone, but she revoked this privilege when he started to use it to show his friends her private e-mails. 2. To cancel an act, particularly a statement, document, or promise; as if it no longer exists: A person can revoke a will or an offer to enter into a contract; while a government agency can officially declare that something is no longer legal. © ALL rights are reserved. Characterized by how something is capable of being canceled or terminated: Sam revokingly discontinued his subscription to a magazine because he was convinced that it was not publishing anything of value. 1. 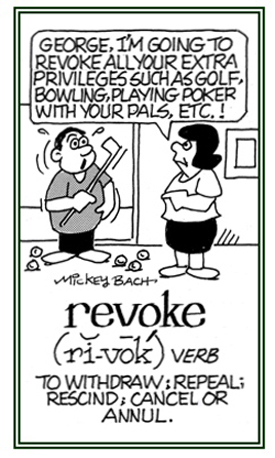 Pertaining to saying something in soft tones, so as not to be overheard: Say it sotto voce, some people say, knowing full well that to shout about it would invite ridicule. 2. In music, descriptive of playing in very soft tones; used primarily as a musical direction: The piano was played sotto voce in the elegant restaurant, so as not to disturb or to interfere with the quiet conversations of the guests. 3. 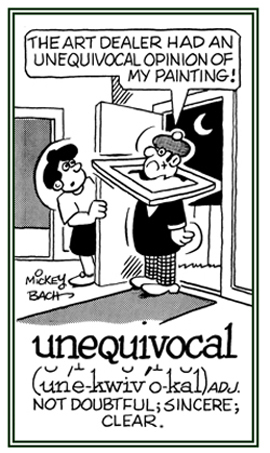 Etymology: from Italian, literally, "under voice", from sotto, from Latin subtus, "under, below" and voce, "voice". Translation: "Under the word [title]." A term used in cross references in dictionaries, encyclopedias, indexes, etc. A reference to an entry in an index, in vocabulary, etc. 1. Concerning a matter having only one meaning or interpretation and leading to a single conclusion: Jack asked Jill if she would marry him, and she responded in an unequivocal way, “Yes, yes, yes!" 2. Relating to a situation which is not subject to conditions or exceptions; allowing for no doubt or misinterpretation: Since Tim spelled all the words correctly in the test, it was unequivocal that he had 100% and received the best grade possible! 3. Expressed in a clear and specific way: The explanations of how to use the coffee machine were very explicit and unequivocal; so, the user would make no mistake in making a cup of the beverage for himself or herself. © ALL rights are reserved. 1. Marked by doing or saying something in an unambiguous and definite manner: Shirley responded unequivocally that she was never going to go to a boxing match with Ralph since she hated that sport. 2. Characterized by leaving no doubt, being clear and having no uncertainty: When Jane, who was 10 years old, asked her mother if she could stay out until midnight, her mother unequivocally and explicitly said, “No way!" 1. Clarity achieved by the avoidance of expressions whose meanings cannot be determined by their contents: In courtrooms unequivocalness is required by all judges who insist that testimonies be very precise and exact at all times. 2. A sincere feeling that is presented in speech or behavior: The principal of the school was known for his unequivocalness and preciseness and so he was respected by all the teachers and students. Relating to having only one meaning or interpretation and resulting in one conclusion: Grace was quite univocal and outspoken regarding the question of capital punishment; so, she always took part in demonstrations against this system and even wrote a column for her local newspaper encouraging politicians to ban this practice. 1. Referring to an attack or a display of aggression or emotion which is not caused by anything done or said: Suddenly Tom displayed a furious and unprovoked outburst of anger, although his friend gave him no reason to respond that way. 2. Relating to something that occurs without motivation or any justification: The news reported that there was an unprovoked attack on a man who was recently walking home from a bus stop in the evening. Showing page 5 out of 8 pages of 115 main-word entries or main-word-entry groups.